Mahatma Gandhi had rightly said, “Sanitation is more important than Independence”. He was aware of the pathetic situation of Indian rural people at that time and he dreamed of a clean India where he emphasised on cleanliness and sanitation as an integral part of living. Unfortunately, we have completed 68 years of independence and we have only about 30 per cent of the rural households with access to toilets. The People’s Movement “Swachh Bharat Abhiyan” recently launched under the leadership of Narendra Modi is a milestone and a step which will transform India into ‘Clean India” which is nothing but need of the hour. Cleanliness is no doubt connected to the tourism and global interests of the country as a whole. India is already a known hub in the world tourist map. It is high time now that India’s top 50 tourist destinations display high level of hygiene and cleanliness so as to change the nation’s global perception. There is no doubt about the fact that change begins at home. Swachh Bharat Abhiyaan should be a combined effort of both the Government as well as the people. 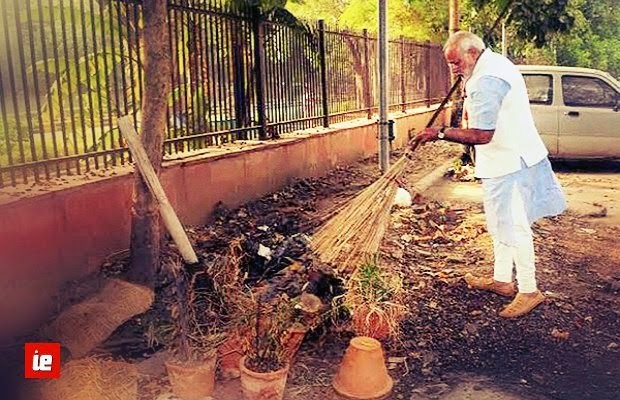 Being an active member out of the 1.25 crore Indians I have some out-of-the-box ideas and suggestions which can contribute to the success of the “Swachh Bharat Abhiyaan”. • Having started this people’s project by the country’s PM on October 2nd, one would have expected a similar response from the CMs of different States. Sadly that was not forthcoming. I wonder if these people could be energized by providing an Annual Interstate Competition’ of becoming the ‘Cleanest State’ of the Year. Similar competitions can be extended to village panchayats as well. The winners may honored with cash reward in the ir public fund and trophies. • I strongly believe in the Mantra of “Soch Badlo, Desh Badlo”. But it is very difficult to change people’s thinking in one go. Instead we should take baby steps to make people habitual. One such step is that the law should be amended or a new set of rules enforceable by law must be in place. There should be separate fines for littering, urinating and spitting in public. The fines can be kept in the range of Rs 100 to Rs 200 only. People from the underprivileged section should be given job where men on the streets can be deployed to catch the defaulters. Anyone found littering or urinating in public should be fined and given a receipt and the money should be deposited in a separate account in the name of “Swachh Bharat Abhiyaan”. The deputy commissioners (DC) of the zones should carry out regular field inspections in different areas to monitor the impact of the drive so that immediate action can be taken if any irregularity is noticed. • For cleanliness drive firstly we need to put dustbins on each and every street of India. If possible at every 100-150 meters so that people know where they have to throw the waste. Less waste or no waste on road can only make India clean. At high sensitive areas like Delhi’s India Gate people usually go for picnics and have home cooked lunch there making the place dirty with used paper plates, glasses etc. It’s okay if one has gone for a picnic but at such sensitive areas a separate control room should be made where few men can monitor through CCTV cameras the movements and if for example someone is found throwing garbage in open, he or she must be penalized. • Swachh Bharat Abhiyaan being a people’s movement needs support of all 1.25 cr Indians to achieve the dream of Clean India. In India people living in rural belt are not aware of the fact what is “Swachh Bharat Abhiyaan”. So how can they contribute their part in this people’s movement. It is suggested that a monthly awareness programme spreading awareness about the need for “Swachh Bharat & its advantages” must be carried out at Panchayat level, school level etc. This can add to success of this mission to a large extent. For spreading awareness no cost should be incurred. Student’s from different colleges can be recruited on voluntary basis. They should educate in people living in slums in their cities. This initiative can add to a huge success and we can make India “Swachh”, a dream of Mahatma Gandhi. A “collective action” is being taken by many social organizations to clean up and green up the locality and subsequently India – a way forward. But it will only be a success if each and every Indian contributes its best.